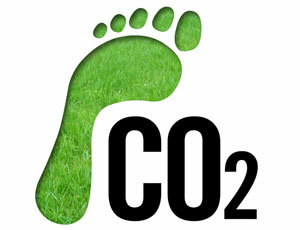 Reducing your carbon footprint is an eco-friendly lifestyle choice that may seem daunting, but is completely attainable. To best understand how to reduce your carbon footprint you need to understand what it is exactly. The carbon reference relates to carbon emissions that result from burning fossil fuels, such as coal, oil, and gas. These fuels are used to power cars, create electricity, heat homes, manufacture goods, and a whole slew of other things. The footprint is a measure of use. So every time you drive your gas-powered car or carry groceries home in petroleum-based plastic bags you increase your carbon footprint. There are definitely large scale ways to reduce your carbon footprint, like installing solar panels or a windmill to power your home, or trading in your gas guzzler for a hybrid car. Big changes absolutely help the environment and may even be a smart move financially, but they may not be the best move for you. Solar panels and windmills are expensive to purchase and setup, but once you’re up and running your monthly expenses are often less, so in no time you’ll recoup the startup cost. Your neighbors may be none too pleased with your decision to install a large, imposing windmill so weigh all of the pros and cons and check with your local building inspector and ordinances before you make any big moves. You don’t have to make grand gestures or go off the grid to reduce your carbon footprint. Small changes certainly make a difference and day in and day out these small changes can add up to a mighty big impact. Reusable grocery bags are a quick and easy way to reduce your carbon footprint. It is estimated that each year Americans use 1 billion disposable plastic bags. Consider how many plastic bags you bring home each time you go to the store. It adds up. You should also note that one reusable bag typically holds the same as two or three disposable bags, so you can carry the same amount of groceries in fewer bags. Stocking up on reusable bags won’t break the bank since you’ll need fewer to get the job done. When looking into reusable shopping bags think about the material. Cotton and polyester bags can simply be tossed into a washing machine from time to time to keep them clean and ready for action. RPET bags made from recycled plastic bottles are water-resistant, so if packaging leaks or if condensation forms on frozen items the bag will contain the mess and moisture. The best way to clean bags made from recycled plastics is to wipe them down with disinfectant cleaner, or rinse with antibacterial soap and water and line dry. The plastic material cannot handle the warm temperatures it can encounter in a washing machine or dryer. Making the switch to reusable bags will impact your carbon footprint right away, and over time less demand leads to less production, so big changes can happen. Hitting up your local farmer’s market is another great way to reduce your carbon footprint. Locally grown food travels a shorter distance than say the produce in your grocery store that possibly came from a different region or maybe even a different country. Picking up produce at a farmer’s market allows you to enjoy fresh foods that are not packaged in non- biodegradable plastic bins. Buying local also gives you the chance to speak with the people who grew the food, so you can make sure items were grown organic or pesticide-free if these traits are important to you. Before you head out to a farmer’s market remember to bring your reusable shopping bags to carry your goods home. Buying local is a nice way to support people in your community and it helps minimize your carbon footprint. Say goodbye to bottled water and pick up a couple reusable water bottles. Bottled water has a massive carbon footprint due to the plastic used to make the bottles and the fuel burned to transport the water from the source to stores all over. Studies have shown that bottled water is not any better than regular tap water (which is significantly cheaper), and in some blind studies people have picked tap water as tasting better than the bottled version. Reusable water bottles keep you hydrated on the go and limit the demand for expensive bottled water. Just like reusable bags, reusable water bottles came in a variety of materials and styles so pick what works best for you. Stainless-steel is durable and easy to clean, while recycled plastic gives new life to what was once trash. You can easily take an eco water bottle along to the gym, or on hikes or bike rides, consider keeping a reusable water bottle at work so you don’t need to use disposable cups. Disposable drinking containers only increase your carbon footprint. On the topic of staying hydrated, when you swing by your local coffee shop have your barista fill a reusable travel mug instead of serving you coffee in a disposable cup. Styrofoam and plastic cups do not break down no matter how long they sit in a landfill, and the plastic-like coating that makes paper cups waterproof prevents the cup from being biodegradable. Another advantage to travel mugs is that they tend to be better at insulating hot coffee or tea so your drink stays warmer longer. The insulated design keeps the exterior cool to the touch which many disposable cups do not, so you can safely and comfortably carry your morning joe without burning your fingers or racking up unnecessary carbon emissions. A lot of coffee shops even offer a discount if you bring your own travel mug so it’s worth looking into. Small changes in your everyday activities can help reduce your carbon footprint and may also save you some cash along the way. There are other ways to reduce, or more appropriately, offset your carbon footprint. You can calculate your footprint (http://www.carbonfootprint.com/calculator.aspx) and fund efforts to reduce carbon emissions or reforestation efforts to counteract your impact. It comes down to what lifestyle choices you feel comfortable making. Bringing a reusable shopping bag to the store or keeping a travel coffee mug handy are minor decisions that may not seem like a big deal, but can pile up pretty quickly. Everything we do requires engrey. Energy mainly comes from compounds that have carbon in them. Reducing your carbon footprint means essentially to live your life while requiring less carbon-based engrey. Therefore, using solar power reduces your dependence on electric power plants that burn fossil fuels (creating carbon dioxide and carbon soot).Buying local produce will reduce the amount of vehicle traffic that burn diesel or gas for power (that carbon dioxide again). You can eat less too, but there are limits.Using recycled paper reduces the amount of trees/live organic material cut down (organic material is full of carbon) to allow us to write.Recycled steel removes the need to mine and purify iron ore, saving electricity and fuel to process.Just remember, your footprint cannot be zero (you breathe out carbon dioxide too), and on top of that, you should (your choice) live a productive life, so at some point, it’s not about the size of your footprint, but the value generated per unit of carbon processed.hope that helps.